Well this week was supposed to include one more day of the SAS symposium, but I was so worn out that I decided to play hooky. I will offer some comments about lessons learned at the SAS and review a great exoplanet news article, a short but informative video on dark energy and a great set of slides describing how to prepare for photographing the August total eclipse and finish up with a fantastic way of simplifying the time needed to setup the telescope for at observatory data collection sessions. Ok, so I was so exhausted from the first two days of the SAS symposium that I skipped out on the last day. I found the hour drive each way, through heavy traffic, to Ontario, and paying close attention to the symposium sessions, without a place to rest or take a short nap, just wore me out. When I have travelled to remote conferences, like the recent AAS conference in Austin, I could always go back to my hotel room between sessions or after dinner before the late night sessions, but here in Ontario I elected to drive up every day and not get a hotel room. Next year I will probably check into the hotel rather than driving every day. How did I drive every day when I was working and still stay awake? 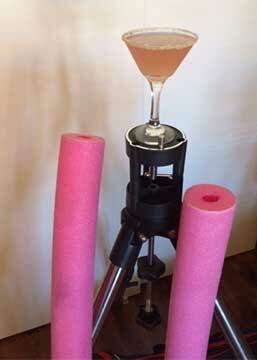 Anyway, when I returned to the observatory, I repurposed the telescope tripod so that if functioned as a martini holder and resting place for the pool noodles as I relaxed and lounged around the pool. I also noticed while at the SAS symposium that I had mixed feelings about the presentations. Yes, they were interesting and I discovered many things that I could be doing in my own ongoing astronomical journey. At the same time, I was getting a little bit depressed because I realized that a lot more work was going to be needed to come up to the same expertise demonstrated by the other serious amateurs there. We each have to adapt and adjust our time to meet the needs of this hobby. I am always amazed by what these amateurs, and by extension each of us, can do in this field. Some observers talked about their success in identifying meteorite strikes on the moon, which takes many hours of patient observation and searching. Some of the presenters came from as far away as Austria and even Australia. Some talked of their investigation of light curves from double stars and others of spectroscopic studies they were conducting, sometimes even with their own homebuilt spectrometers. 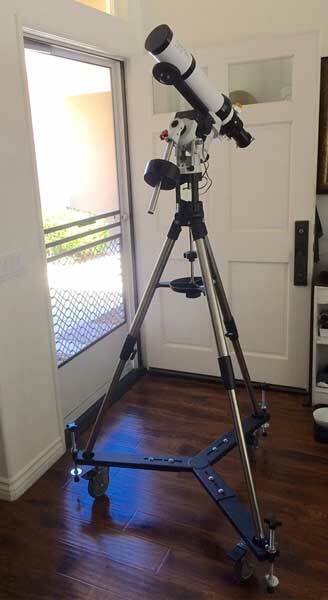 Many of the presenters had very impressive backyard observatories even one that 32 inch telescope. Many amateurs were part of STEM collaborations with local high schools and such and they introduced science to many students through actual hands on observation, which resulted in papers published to AAVSO standards. Good introduction to science for all ages. Also there were discussions of upcoming opportunities for "citizen scientists" to participate in real ongoing and upcoming scientific missions. Some backyard astronomers are even investigating exoplanets. Pretty neat! 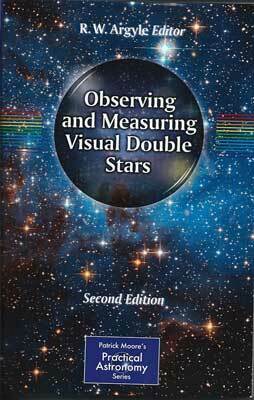 One of the SAS authors recommended a great little textbook for amateurs on the ins and outs of observing double stars, so my friends at Amazon quickly shipped me a copy and wow, yes, it is a great book. It is chock full of observing tips and theoretical discussion and calculation at just the right technical level. 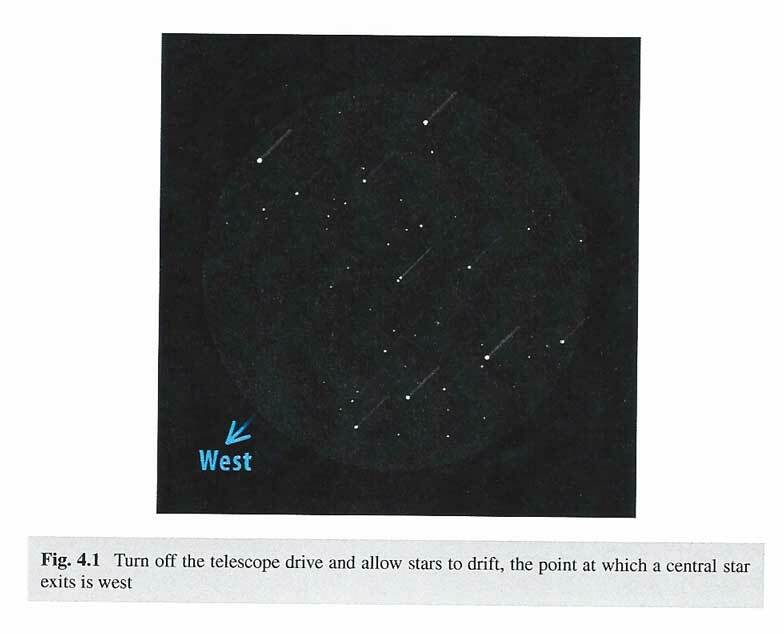 One chapter of the book that immediately answered a question that I have had for many years now was how to identify the orientation of an astrophotograph. You yourself have probably already experienced this when observing the same object through many different telescopes at a star party and noticing how all the images are oriented at different angles and such. Some are inverted because of the type of telescope and number of reflecting surfaces and often in my case the orientation of he camera can be rotated and changed to fit the viewer and the orientation of the object changes accordingly. Well the book described how to identify the orientation of your current camera or eyepiece by this simple drift method outlined in the figure taken from the textbook. The method is just to turn off the tracking drive momentarily, which is easy for these examples taken with just a camera tripod, and then observe the motion of the stars in the image. The rotation of the earth causes the stars to seemingly move to the west so the current camera field of view can be marked to indicate which direction is West. That is pretty neat! Next, the other directions or cardinal points can also be identified by considering the number of mirror reflections in your telescope optics. In my case, with an even number of reflections due to the single lens and camera electronics, North is 90 degrees counter clockwise from West. 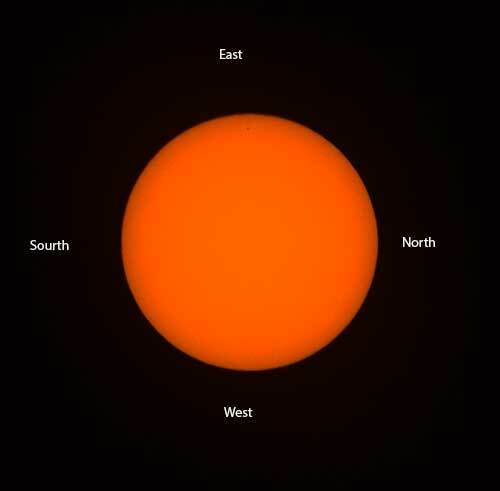 See my test image of the sun in the photo below where the cardinal points have been identified and shown. These images were taken with just a 300mm lens and DSLR on a tripod. It is too bad that the sun is very quiet now and visible sunspots would have made this demonstration of orientation much more educational. Don't be confused by the orientation of the cardinal points in these photos which differs from the orientation we are used to seeing on road maps where the top of the map is usually assigned to North and then East is on the right hand side of the map. Imagine these astrophotos as if you hold them at arms length and orientated as if they are the same as the camera would see pointed toward the object in the photo. 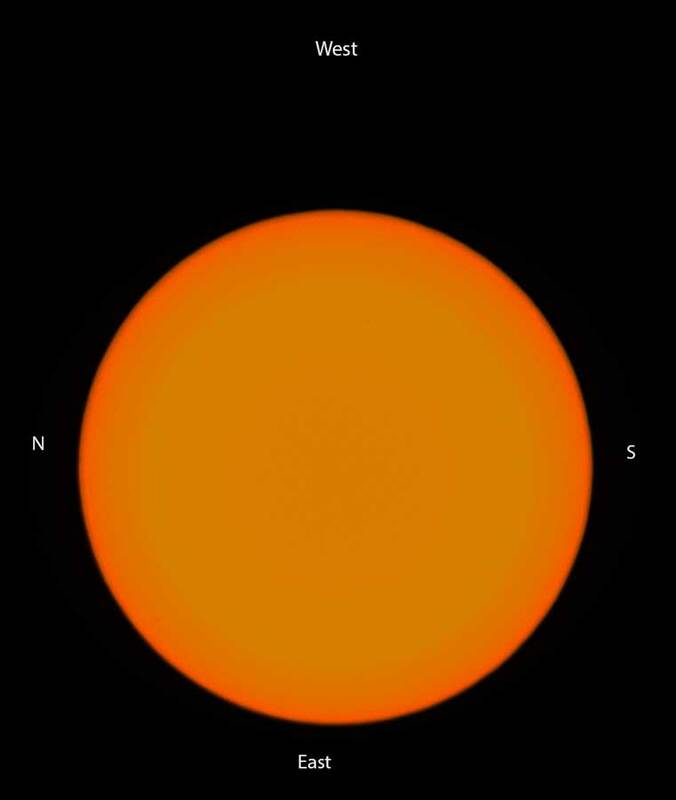 Also please don't be confused by the different size of the sun in the images; I just wasn't diligent in my Photoshop cropping and enlargement. Sorry! This same exercise was repeated later in the day and in this case the image was seen to slowly drift to the bottom of the screen, which again identifies the West cardinal point. This new learned technique is really neat in that now, finally, I can assign an orientation to my photos even if my camera is rotated in various directions. All, I have to do is turn off the clock drive and notice which way the stars drift. Pretty neat! Why has it taken so many years just to learn this little lesson? Another lesson I learned during this session is that there is no way I am going to be able to deal with my solar filter when observing the total solar eclipse in August. The solar filter has fine threads and the plan would have been to have the filter on until totality then it would be unscrewed and removed during totality and then definitely would have to be put back in place following totality. I found that this was not going to be easy to do during the highly charged and emotional eclipse and during total darkness. I need to find an easier filter removal and installation technique for the upcoming eclipse. Ok, that is all the observations I had time to make for this week, but you might find the following three references to other articles and videos and presentations, submitted by readers of this blog and other associates, as interesting as I did. e use of a dolly with large rubber wheels makes it possible to just leave the setup all assembled and just roll it in and out with ease. Check out this new arrangement in the photo below. The wheely bars make a strong sturdy tripod base and the large 5 inch rubber wheels don't mare Resident Astronomer Peggy's wood floors at all. Yes, in case you were wondering, the whole setup does make it under and out the door. The natural spread of the Ioptron tripod is 43 inches, but to be able to get down a long hallway the spread is limited to 35 inches, but still seems to be very stable. My next chore is to just add camera and battery and take the whole mobile platform out for a test spin and observation..
Great article for the people having interest in astronomy. Loved to read your experience at SAS Symposium,we also learned alot from your experience at this symposium.